Christian, geek, writer, and creator of Tweet RPG! Hello all! It's been quite a while since I posted on this blog, and I'll be honest, it will be probably a long time before I can spend any time on it in the near future. This post is essentially a signpost, pointing you to where all my efforts are being focused. As much as I'd love to be able to do some article writing or get into drafting a novel, Tweet RPG is where it's all happening at the moment. Not that I'm apologising for that - it's so exciting that the system is gaining new followers and players, and I want to give it all the time I can justify. 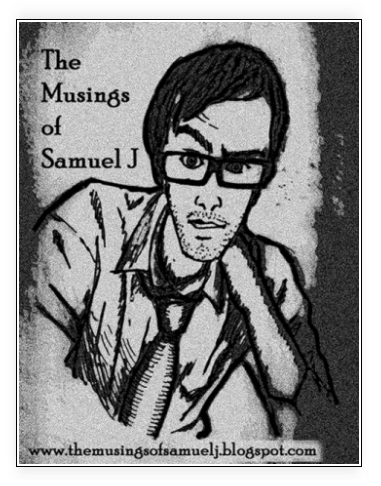 To conclude, if you want to get some 'Sam Richards writing goodness' in your life, you will find it here, but all the fresh meat is over at tweetrpg.co.uk - thanks for reading! Meet me at the UK Games Expo! I'm off to the UK Games Expo! Would love to meet up with my digital friends in real life - find out more here! Welcome, Ralph! Tell us a bit about yourself. Hello everyone, and special thanks to Sam Richards for setting up this interview! I’m a self-described explorer of everything (from outer space to human nature), and in recent years I have started to share some of my exploits in the form of scifi novels and short stories. I was born and raised in Western Europe to parents of German, Spanish, French and Moroccan heritage, and then migrated myself to Seattle in the US at the age of 20 to study aerospace engineering. Seattle being the “Gate to the Pacific”, I picked up strong influences of Asian culture there together with three college degrees, and since then I have worked as an engineer at various space companies along the west coast. Currently, I live in Los Angeles California, and make a living working for Elon Musk’s Space Exploration Technologies (SpaceX). From my brief research, I can see you lead a pretty active lifestyle – how do you find any time to write? That is a really good question. Life does keep me busy, and I learned long ago that time is absolutely the most precious (and ultimately finite) resource there is. There is so much I want to do, and you can trade time for just about anything else, but you’ll never get it back! I do lots of work in my head while occupied with other mundane tasks – I’ve had some of my best ideas while taking a shower or working out – so when I sit down at the keyboard, it’s really just to do a data-dump of everything that’s piled up in the last couple of hours or days. Throughout the year, I keep collecting ideas for places, characters, and story lines; only when a given project has reached critical mass do I start the actual writing. It’s become a bit of a winter-holiday tradition for me to bang out a new draft for a novel (most recently for Sadaka, the second book in the Lucid Space series). I also travel quite a bit between California and the SpaceX launch-site at Cape Canaveral Florida, and those long flights are great for getting some uninterrupted writing time. When did you begin writing and how did you develop to where you are now? I’ve always loved reading scifi. One of my earliest addictions was my dad’s collection of original Star Trek books. When I took my first creative writing class in high school, I wrote a short story for a Star Trek episode which grew serious legs around the school. As a teenager, I took up Kendo (Japanese style sword fighting) and other students in the dojo introduced me to table-top role playing games like Call of Cthulu, Midgard, and War Hammer 40k. I created game scenarios for my friends, which was a fantastic learning experience because you literally get instant feedback on your story, and you learn how people behave in stressful situations. If you want to know what your friends are really like, share a 24 hour RGP session with them, while everybody is hopped up on caffeine and trying to navigate their favourite character through an alien attack encounter – it can be a real eye-opener! When I got into my twenties, I finally decided to try my hand at the first draft of Eleuthera. Over the years, I re-wrote that book dozens of times, until the advent of self-publishing finally made me put it in front of the public eye in 2011. Tell us about your books – what are they about? For me, a good story needs three essential ingredients: interesting characters, a world worth exploring, and “something to say”. In some ways, I really start with the characters and then I’m just along for the ride, watching them grow as individuals and explore the world I build around them. I’m insatiably curious about any form of exploration, both “external” as in space or ocean exploration, but also “internal” as in transhumanism and evolution of life in general. There is beauty all around us, all you have to do is pay attention to it. I want my readers to have fun with my writing and discover wondrous new worlds, but I also want to make them think a little – to look at familiar things in new ways, or maybe even realize something new about themselves. I see you work for NASA – as a science fiction writer, how much does your work inspire your writing? To be precise, I’m not a NASA employee; however, the work I’m involved with at SpaceX is mostly funded by NASA, since we are developing a new spacecraft to take both cargo and people to the International Space Station (ISS). In my writing, I draw on my knowledge of astronomy (all of the locations in my stories exist in reality), engineering (most technology in my books is an extrapolation of current capabilities), and even operations. In the last two years, I went through a lot of training to operate the SpaceX Dragon spacecraft from the ground during its flight to the ISS. When we work in Mission Ops, we use a voice intercom system (think radio but it goes over hardwire) to coordinate the various locations and people involved in the operation. If you listen to the conversation on those voiceloops without being in the control room, it gives you a kind of tunnel vision on what’s going on. In Sadaka, there’s an opening scene where a crisis develops on a space station, and I wrote it like a transcript of the voiceloop traffic in the mission control room. It’s like giving the reader the whole picture one pixel at a time, until the entire scene comes together in their mind and makes them go “holy [insert favourite expletive]!” when they suddenly realize what’s going on. There are so many, it’s hard to pick one or even just a few. Growing up I read a lot of the scifi classics like Asimov and Heinlein. As I ran out of mainstream material and broadened my horizons, I discovered both old and new books which had a lasting influence on me. Going back in time, Norman Spinrad is one of my favourites, together with Edgar Rice Burroughs. Older scifi often has a range and depth of imagination which far exceeds more contemporary books; so little was known then about the realities and technology of our modern world that authors just had to make it up, and the line between scifi and fantasy gets very blurry. More recently there were William Gibson with Neuromancer, Richard K. Morgan’s Altered Carbon, and Peter F. Hamilton’s Reality Dysfunction series. All of these books project not just a technological future, but also new forms of society and human interaction. Last but not least, I’m also a huge fan of Neal Stephenson, whom I had the honour of meeting at Jeff Bezos’ Blue Origin space company once. His books are awesome fun to read and usually depict mind-bendingly bizarre (yet fully believable) societies; Snow Crash and Anathem are two of my favourites. You've travelled a fair bit and worked in a variety of vocations – how has this aided you as a writer? My family is very international; I grew up in Europe but have familial ties to both North America (Canada) and Africa, and close friendships with many people in Asia. It certainly has added to my experiences and interactions with all kinds of people, cultures, and places. But it’s not just different places, but also being a part of different strata in society which I encountered working as a musician, a roadie, a lumberjack, a vineyard apprentice, and with many government and commercial space organizations. There are some stories with great plots, but as you read them you can’t help but think “people just don’t behave that way - lame!”. As a writer, I think it helps to have had interactions with people in all walks of life. A character born into wealth and corporate power will act very differently than one who has lived perfecting the skills of craftsmanship. Two people can have completely different perspectives when looking at the same situation, because all their life they’ve had very different priorities. Tell us a little about your use of social media to promote your books. Social media are a powerful tool to let people know of your existence and what it is that you would like to share with them. My heaviest use of social media is probably my blog (www.onehandpublishing.com/blog/ralphewig) where I post any interesting bits on space, design, beauty, scifi, and technology I come across on during my day. All posts are pushed to my twitter feed (@OpenAerospace) which over time has gathered more than 15,000 followers. Ultimately, the work I do in space exploration is funded by the general public, so I feel a strong desire and obligation to share the wonder and excitement I’m privileged to enjoy every day with as many people as possible. What's the biggest mistake an inexperienced writer can make? Lack of editing - as an unpublished author, it’s really hard to find someone to edit your story. Online services charge four digit numbers (and there’s always that worry they might rip off your story), and asking friends or family can be emotionally challenging. My mother once came across a draft for a story I had typed up with some pretty explicit content – awkward to say the least! On the other hand, one of my professors in college told me: “A bad idea presented well will fail eventually. A good idea presented poorly will fail immediately.” Be a perfectionist, details matter - no story should ever see the public eye on the first draft, keep editing, polishing, chipping away at it until it is perfect; and then have someone else copyedit it for you for good measure. And finally, what's the key to successful self-publishing? I think the key is to look at self-publishing as a journey rather than an event. Don’t expect to wow thousands of readers with your first story when it finally hits the shelves. There are millions of books for people to choose from, and with the availability of ebooks (which never go out of print), that number continuous to sky-rocket. Even if you’ve written the most brilliant book since The Hitchhiker's Guide to the Galaxy, it won’t matter unless people know it exists and have a way to get their hands on it. After you’re done writing, you need to introduce yourself to your potential readers (marketing), then the presentation of your story needs to convince them to start reading (cover design), and lastly you need to encourage them to share what they thought with as many people as possible (reviews). It takes time to build a base of loyal readers, and once you have their admiration treat them with the respect they deserve. If a tree falls over in the forest without anybody there to hear it, does it make a sound? Helvetica Outbreak: The best thing that never happened to music! My housemate and best friend from university came to stay last week, and as we relived the old days it reminded me of a little project we sank quite a few hours into - introducing Helvetica Outbreak, the ultimate drum 'n' bass/metal cross-over that sadly didn't make it! Equipped with a couple of electric guitars and a macbook with Garageband, we had high ambitions which sadly were never realised. However, looking back on our jamming sessions, it doesn't matter that the music didn't travel much further than our ipods, because we had fun. The Helvetica Outbreak myspace page still exists, so you can listen to our tracks - let me know if you like them! I'm an English and Creative Writing graduate who studied at the University of Portsmouth. I am a passionate Christian and would love to one day be a published writer. The heavy metal you SHOULD be listening to!